Science has finally caught up with what our Great Grandmothers knew. Broth is beautiful and maybe even a little bit magical. There is nothing so soothing or beneficial for invalids and growing children than a rich, nutritious broth. It contains a huge array of bio available minerals including calcium, magnesium, phosphorus, silicon, sulphur and trace minerals. It also houses the broken down material from cartilage and tendons–stuff like chondroitin sulphates and glucosamine that we now spend big bucks for in supplemental form. There are also unique properties that heal and calm the lining of our stomachs and extensive GI track. It is easy to digest making it ideal for fortifying and boosting the nutrient count of the very young and the very old. When broth is cooled, it congeals or “gels” due to the presence of gelatin. The use of gelatin as a healing nutrient goes back to the ancient Chinese. Just as vitamins occupy the center of the stage in nutritional investigations today, so two hundred years ago gelatin held a position in the forefront of food research. Gelatin was universally recognized as a most nutritious foodstuff particularly by the French. Although gelatin is not a complete protein, containing only the amino acids arginine and glycine in large amounts, it acts as a protein sparer, helping to stretch a small amount of meat into a complete meal. The French were the leaders in gelatin research, which continued up to the 1950s. Gelatin was found to be useful in the treatment of a long list of diseases including peptic ulcers, tuberculosis, diabetes, muscle diseases, infectious diseases, jaundice and cancer. Babies had fewer digestive problems when gelatin was added to their milk. The American researcher Francis Pottenger pointed out that as gelatin is a hydrophilic colloid, which means that it attracts and holds liquids, it facilitates digestion by attracting digestive juices to food in the gut. What do you make it with? Great broth is made from bones but most especially joints. Gelatin is especially high in the joints of Cows and Deer, and the feet of chicken. Cow’s feet should be thoroughly scrubbed (and in my case dunked in boiling water and scrubbed a second time. It’s totally a mental thing for me) and diced into 1 inch cubes. Same goes for Deer. A butcher can do this for you. Request him to place them in 1 quart bags. Chickens feet can be scrubbed down and chopped in half and stuck straight into the pot (yes, gross looking toes and all) You can store them in the freezer long term before cooking and pull it out as needed and as you have time. Although larger bones can be used for broth you will need to crack them or have them cut into shorter segments to fit into the soup pot and also to allow the incredible marrow and other goodies to infuse your broth. Some say to keep the marrow bones separate because there are recipes that you can use to cook the marrow separately and it is considered a miracle working food in it’s own right. I however rarely have the time to separate them out and fool with it so the marrow bones end up in the stock pot along with everything else. Find a store that carries hormone and antibiotic free, grass-fed, free range meat and does at least some of their own processing. You can purchase bones, knuckle joints etc. from places like Whole Foods. If you live rural like we do you can contact local meat processing places that process venison and homegrown beef. 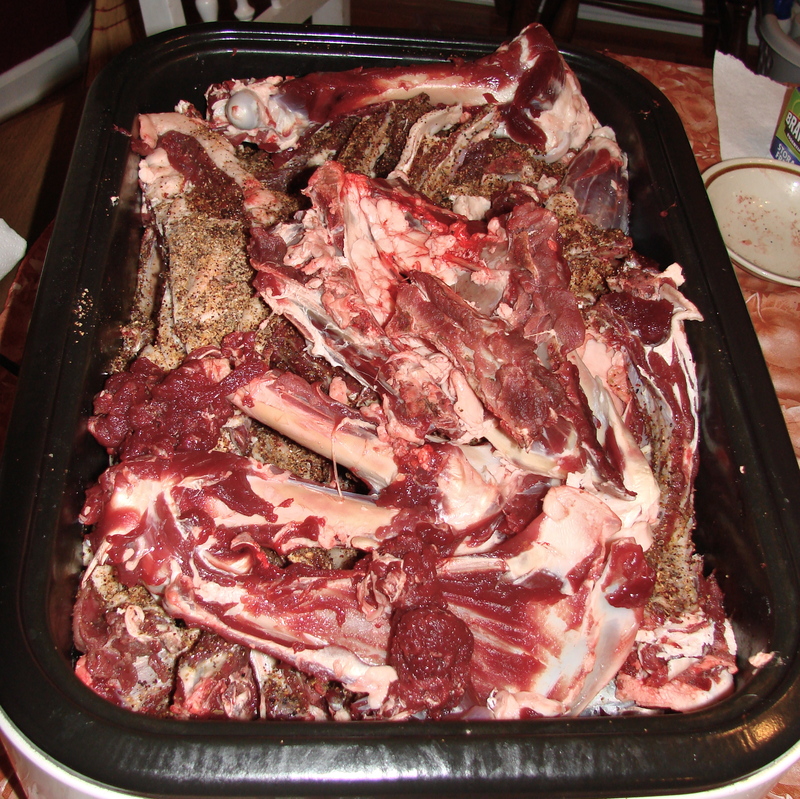 Most people have no interest in the bones and if you let them know that you have a good use for them they will save them off to the side for you or give you a call when they have some available. Some ethnic markets have chickens feet available for sale. Again, this is an item you might be able to track down from a local chicken processing place. *Note: Farm-raised, free-range chickens give the best results. Many commercially raised chickens will not produce stock that gels. Add additional water, if necessary, to cover the bones; but the liquid should come no higher than within one inch of the rim of the pot, as the volume expands slightly during cooking. Bring to a boil if you are using a pot on the stove. A large amount of scum will come to the top, and it is important to remove this with a spoon. After you have skimmed, reduce heat and add crushed peppercorns and 21 spice mix blend. I also frequently use a crock pot to make stock with. It is difficult to bring anything to a “boil” with a crock pot so I typically just have it on high for two or three hours and then back it down to medium or low and keep it there the rest of the time. When using a crock pot I let it go a full 48+ hours to make sure I’m getting enough out of it with the lower heat. Streeeeetch it out Tip: I do what I call “double boiling” and use my bones a second time. This helps what bones I have access to go further so that we can actually have broth at least once a day instead of a couple of times per week. Second ’round broth is not nearly as rich or filled with gelatin as round one. I use this “lesser” stock to cook my rice or other grains in and also use it in the place of water in other recipes. While there is definitely a difference in quality between the first round and the second round there are definitely enough nutrients left in the bones that it makes it worth while. Maybe one of these days I’ll have so many bones I won’t know what to do with it all but in the meantime this is what we do to maximize what we do have access to. Simmer stock for at least 12 and as long as 72 hours. You will now have a pot of rather repulsive-looking brown liquid containing globs of gelatinous and fatty material. Remove bones with tongs or a slotted spoon. Strain the stock through a fine mesh strainer into a large bowl or pitcher (I prefer a wide mouthed pitcher because it’s easier to pour into jars) Transfer to smaller containers ( I use recycled Classico canning jar’s that spaghetti sauce comes in). Pour the hot stock into jar’s or other containers and let cool completely before putting into the freezer for long term storage. Make sure to leave sufficient head space for expansion when frozen. 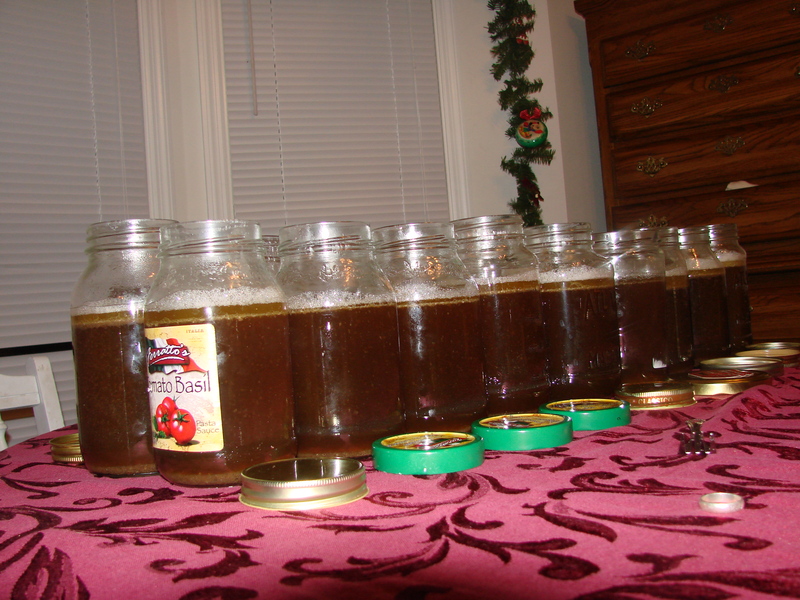 When I attended the Weston A Price Conference this year in Chicago someone asked Sally Fallon Morell (President of the WAPF) about canning the broth. She said it is not advisable because the extremely high heat and extended period of time it has to be processed. Apparently the really high heat damages some of the beneficial properties. The instructions are the same as for the beef and venison. Only primary difference is chicken stock can’t go quite as long as the others because the bones are softer and smaller and literally begin to disentigrate after 24 hours or so. There is much more to be said on this subject but this shall suffice for one post. Leaves lots to talk about in the future! As always comments and questions welcome. =D I’m off to eat a sprouted wheat homemade noodle Lasagna made my dear friend Zizzie. Ciao! I LOVE the chicken stock recipe that Jordan Rubin uses and I think I’ll base my beef stock off of that. Adding in coconut oil, spices, and veggies. I added you to my linky love post this week! Thanks for the great post :D.